Our List of USA Used Car Dealers* is your most comprehensive and up-to-date resource for finding new sales prospects in the USA. The List includes details such as the businesses website, email address contacts, street address and telephone numbers – vital business intelligence to help you reach your target market audience and achieve better returns on your marketing investment. *The focus of the research when compiling this list was to find Car Dealers however it is possible that some of the business listed are New Car Dealers that also offer Used Cars. 20,000 Unique Businesses – ALL with at least one Email Address Contact. 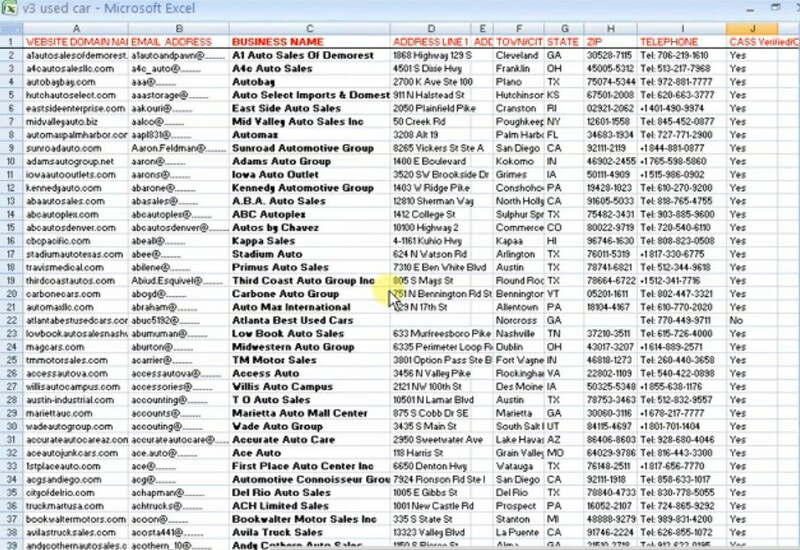 32,329 Unique Email Address Contacts. 80% of records with CASS** Verified Street Addresses. 20% of records with partial address – all records include State and Email Addresses. 99% of records with Telephone Numbers.